Key West international airport is a facility served by American Airlines, Continental Airlines, Delta Airlines, US Airways Express and Republic Airlines. Additionally, two local air carriers provide Air Taxi servies as well. There are numerous rental car services which are located at the airport facility. They include Thrifty, Dollar, Alamo, Hertz, National, and Enterprise. Also numerous scooter, moped and electric car rentals can be found throughout the city. For those who wish to be green, sure to check out themany locally owned and ooperated bike rental businesses in Key West. If you'd like to head out on the water, boat rentals and ferry services are abundant. Be sure to check out the many water based excursions available. 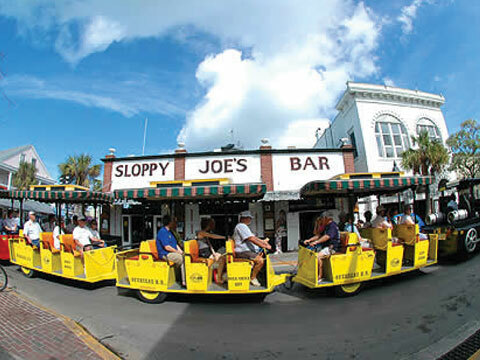 The most popular city tour is The Conch Tour Train and Trolleys. There are always unique ways of getting around the Key West, be it on land, sea or in the air.